Anne Huntington in her apartment. Portrait by Sophie Elgort. On the surface, Anne Huntington and Brendan Fernandes may look to have the classic collector/artist relationship. But in reality what they share is based on friendship, collaboration and a loyalty that defies definition. Over the years, they have supported each other in myriad ways: Brendan has donated original works to philanthropic causes Anne is involved with, while Anne has continued to collect Brendan’s art and incorporate his work in shows she curates. They have also collaborated on a number of projects at institutional levels, including the upcoming Young Collectors Council benefit at the Guggenheim in April 2019. The two reminisce on their friendship in the art world and beyond. Brendan Fernandes: I met Anne along the Grand Canal during the 2009 Venice Biennale. Her magnetism was contagious and we became fast friends. Anne Huntington: We had no clue that 10 years later we’d have countless professional and personal experiences together. We’ve guided each other towards the next great adventure and truly made our dreams come true. One of Brendan Fernandes’s recent neon works. BF: Years back, Anne acquired the first edition of a series I created while at the Robert Rauschenberg Foundation Residency on Captiva Island. Little did she know at the time, but this acquisition helped pay my rent. AH: When Brendan returned from the residency program, we scheduled a catch-up that included a studio visit. This must have been 2013. When he shared the works with me, they were so special and strong. They were the first prints made on Rauschenberg’s presses since his passing. The works showed conceptual rigor and ideas while connecting to Rauschenberg in creation and thought. I believe these prints highlight an important moment in Brendan’s career and I’m honored to have them in my collection. As a collector, I’m looking for these moments over an artist’s career, all the while continuing to support the artist through the years. Every performance and exhibition of Brendan’s highlights the breadth and depth of his practice—the latest being at the DePaul Art Museum, which I viewed during the 2018 EXPO Chicago. This exhibition connected dance, sculpture, photographs, works on paper and masks. The masks are a defining element in Brendan’s works that symbolize a significant relationship and meaning. 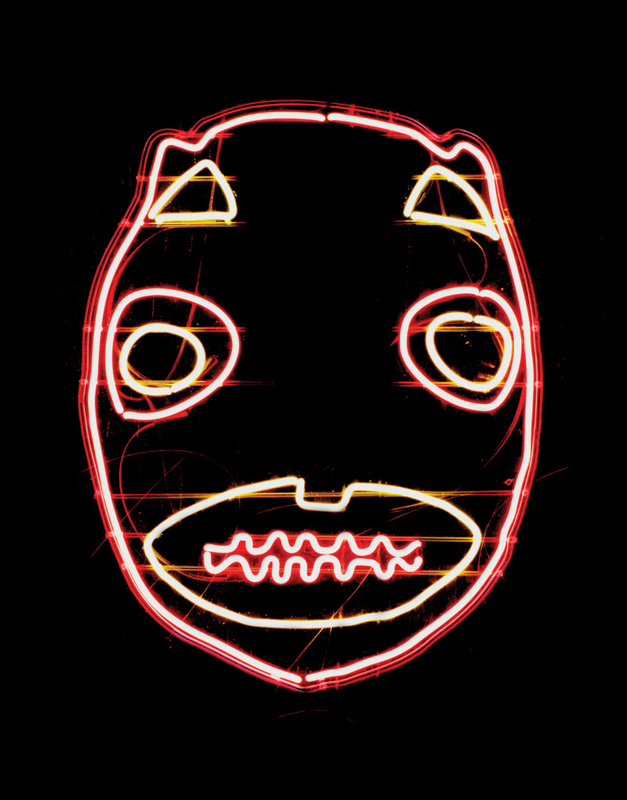 The neon masks continue to be elements in shows, including one at the Brooklyn Museum in 2015. I also had the honor to co-curate a neon into the 2017 Spring/Break Art Show. Now I am proud to have two masks, one neon and one mirrored, in my collection. BF: Anne and I champion each other, we look out for each other. Regardless of the gaps in between our visits, there is an immediate sense of warmth and love when we are together. Anyone who knows Anne knows she wears many hats with ease and grace, yet she always makes time to be present, kind and authentic. When Anne says something, you listen. And when Anne says something’s going to happen, well, it always does. BF: Our friendship is based on the notion of collaboration, and in the past decade we have supported each other in all areas of life. AH: We’ve rung in the New Year many times, traveled together, visited several artist studios, discussed art and culture, all while helping each other dance through this thing called life. BF: Our roles complement each other and create exclusive ways of being and mutual ways of supporting and generating. AH: We collected each other, which means we have each other in our everyday lives.